We have a couple of neat pieces of equipment at Gunner's Great Garage including a big C-Aire upright air compressor, a 20-ton bottle jack press and a giant Eastwood media blasting cabinet. However, the machine we probably use most in our day-to-day restoration work is the bench grinder with a wire wheel. This is a relatively inexpensive tool that can pay for itself in time savings. 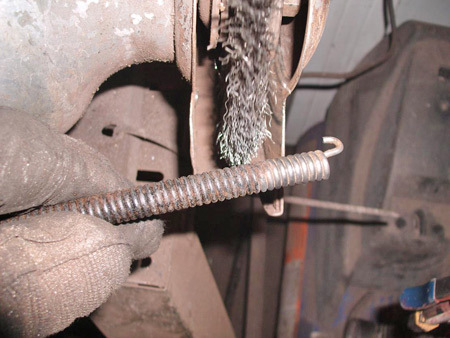 The wire wheel can remove dirt, grease and oil from a part or can be used to polish it. MG TD brake fittings prior to wire brushing on a bench grinder. These parts could be replaced with catalog parts for $372 plus shipping. The wire wheel clean up took a half hour or $20 labor at our shop rate and free for the D-I-Y. The same parts after wire brushing. 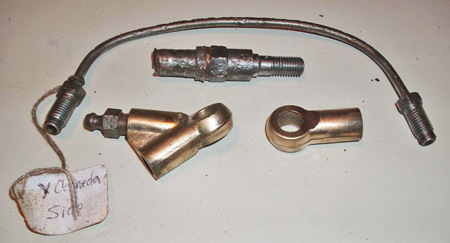 We saved the brass banjo fittings that cost $151 for the pair and the $20 steel wheel cylinder adaptor. 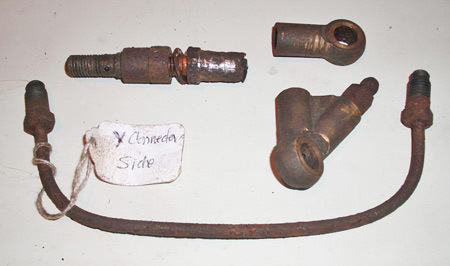 The mild steel brake pipe with two fittings is pitted and will need to be replaced for about $18. After a few minutes against the wire wheel, a brass brake line fitting that at first resembled a piece of junk seemed like a candidate for museum display. Rusty Whitworth bolts for an MG TD that would cost a couple of bucks each to replace can be saved and put back into service with a wire wheel clean up. After being lightly media blasted and then buffed with a fine wire wheel, a once-crusty old carburetor looked like a part for a Duesenberg rather than a Dodge pickup. If you were having a vehicle completely restored at a shop like "3 Gs" and a professional restorer was charging you $40 an hour (or more) to clean up your parts, fittings and fasteners with a wire wheel and then prime and paint them, you would be spending thousands of dollars for work you can easily do yourself. And the professional would not be ripping you off-he'd only be charging you for his time. This work takes no special skills and if you have the time you can save big. Even the filthy brake return springs cleaned up perfectly. At $16 each plus shipping for four new ones, this clean up saved us about $67. With all we saved on this job we could buy ourselves the Cadillac of grinders and have change. 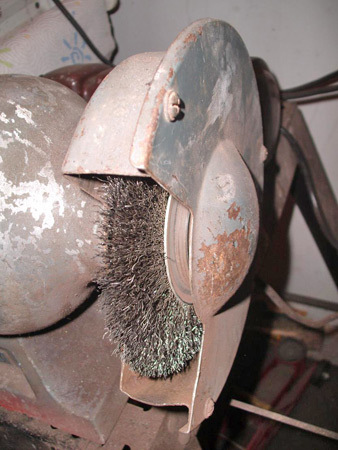 You can probably shop around to get an old bench grinder for $10 or $20. The one I use at home is pictured and fits in this category. Discount tool stores will cough up a nice bench grinder for around $49 and $79 will get you a better model with a stronger motor an overstock Website. Brand name grinders can run up to $150 or more. A new grinder will look prettier than mine and have a face shield, which is a plus. But this second hand grinder works fine in my home shop. Grinders come in 6-, 8-, 10- and 12-inch models and bigger ones cost more. If your bench grinder has two grinding wheels, replace one with a wire wheel. Buy only high-quality, name brand wire wheels. Cheap ones look just about the same, but the wire bristles will come flying out at high rpms much more easily. Like sandpaper, the wire wheels come in coarse, medium and fine varities. For restoration work you'll need at least the fine type. There are also special "knotted" or "braided" wire wheels for removing rust or paint, but these work better on handheld grinders where you can move the tool into tight nooks. You will also find wire wheels made of different materials like brass, mild steel and stainless steel. Locksmiths even use a wheel with plastic strands that is very good for light pressure work. A good quality mild steel wheel will run $12 to $15. Stainless steel wheels will cost more. A stainless steel wheel is a must if you are working on stainless steel. If you use a mild steel wheel, the carbon steel particles that fly off into the stainless steel will stay in the stainless and rust. To install a new wire wheel, first remove the outer plate on the back guard by taking out five or six short screws. Set the plate aside being careful not to loose the tiny screws. Then keep the wheel from turning with the machine's hold button, a screwdriver or vise grips and undo the large, reverse-thread bolt that holds the wheel on. You may see discs or washers designed to keep the brush from freewheeling on the arbor. The new wheel will have a nylon spacer in the center hole so it can fit different arbors. Ours needed this spacer to fit snuggly on the arbor. Put everything including the back guard back together the way it was. We like using a 1/3-hp grinder that runs below 2000 rpm with a six-inch diameter fine stainless steel wheel. This setup is very good for taking rust off parts without hurting the finish. The 6-inch wheel gives the most contact with the part for each minute the wheel spins. This is because the friction zone where the wheel hits the part comes around faster and more frequently per minute. Since a wire wheel throws debris and material off parts you work on, you should not use a grinder unless you have safety goggles on to protect your eyes. Since it is almost certain that tiny pieces of the wire wheel will break off and fly back at you, it is even better to protect your full face with a plastic shield. I have noticed that my white beard tends turns a little grayer when I use the wire wheel. 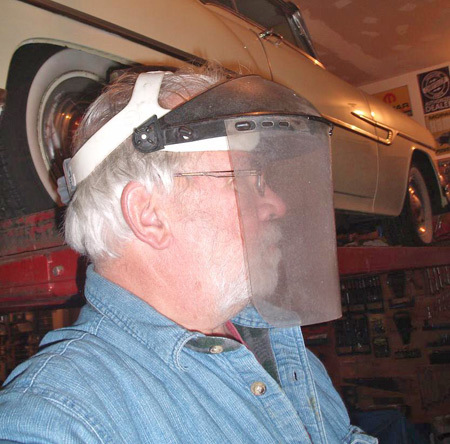 Eastwood sells this full face shield that is perfect for wire wheel work. It cost a bunch less than what a doctor will charge to extract tiny slivers of steel wire from your eyeball (after which you may still have a lot of trouble seeing). Some experts recommend no gloves to avoid getting them snagged in the wheel. Other say to wear leather gloves. I compromise by wearing tight-fitting mechanic's gloves with leather finger tips. If you've ever seen the grit around an area where a wire wheel is used a lot, you know that an apron is a good idea. In fact, if you do a lot of wire wheel work, a leather apron is best. Most of the debris will fly off the back of the wheel or towards the floor, but you will still catch some. Before you start a bench grinder, make sure the nuts that hold the wheel on are tight. Check the electrical cod for breaks. Be certain the grinder is on a flat, solid surface as it may shake if it isn't. Check the tool rest to make sure the wheel isn't hitting it and adjust if necessary. If there is a glass safety guard, place it in a good position. If the grinder has a tray to hold cooling water, make sure it is filled. Check that the electric cord is plugged in. Stand to the side of the grinder and turn the power on. Let the grinding wheel come up to speed before starting work. End plate held on back shield with tiny screws comes off to allow brush replacement. Brush turns downward. If brush snags a small part it will shoot it around inside shield and direct it towards floor or foot, so wear steel-toed boots. Hold the part you're cleaning or polishing against the wire wheel. Make sure you have a firm grip on it. If you hold a piece too loosely, the wheel will snag it and pull it into the back shield and it may come flying out the other end — towards you — at high speed. In most cases, a snagged part will be thrown against the floor and though it won't hit you, the part can easily be lost forever. To avoid this type of problem, hold the part very firmly and let the wire wheel do the work. 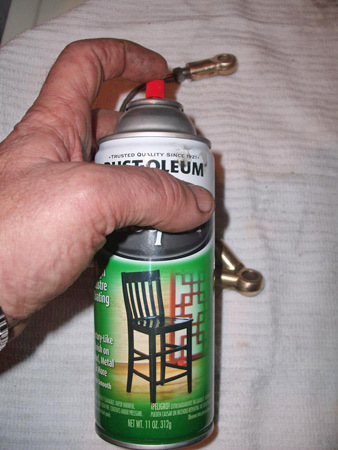 Pressing the part too hard against the brush will only burn or dull the metal anyway. If your grinder has a tray, dip the part in the water if it gets too hot to handle. Expert buffers work parts on the lower quarter of the front of the wheel, and this seems best for wire brushing, too. However, remember to hold the part firmly so it doesn't get snagged and pulled into the back guard. One technique we discovered for great polishing is to media blast some parts first, then polish them with a fine wire wheel. This gave an amazing finish on one aluminum carburetor, but it may not work on all metals, so try a similar test piece first. After cleaning metal parts by wire brushing, they will rust quickly if not oiled, painted or sent out for anodizing. We often spray bomb such parts with clear lacquer. Don't use too much on a fastener and re-spray later after assembly.